First Aid at Work Level 3 (VTQ) Requalification blended part 2 for those who have completed the online part and have a qualifying FAW certificate that needs requalifying. 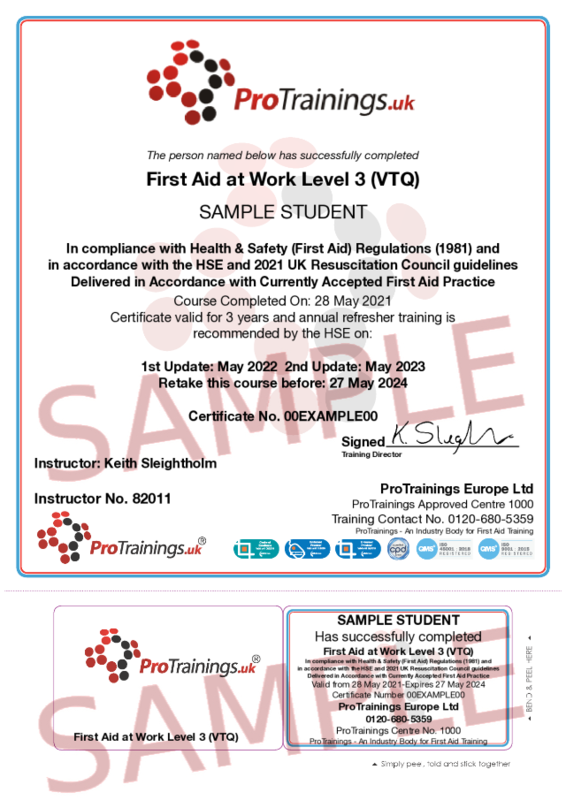 The ProTrainings First Aid at Work Level 3 Requalification Qualification (FAW) is ideal for most businesses whose risk assessment has identified that they require a fully trained first aider for their workplace and they need to requalify their certification. In May 2016 the HSE and Awarding Organisations announced that computer-based blended training is now allowed for all workplace first aid courses. You can now renew your First Aid at Work qualification, with one day of classroom training after completing this online course. Reduce your training and travel costs by using our engaging, blended online video-based course. Learn at your pace, one to one with your instructor at a time that suits you. This course is only for people who already hold a valid First Aid at Work certificate You must have a copy of your original certificate.